From the first Thanksgiving to the present day, Native America culture has been an integral part of both New Jersey and American history. Spend an afternoon, exploring and learning about the first people of America and how they lived. Go visit a wigwam or a restored village! American Indian Room contains a collection of stone tools made by Lenni Lenape Indians. 32 Evans St, Franklin NJ, 973-827-3481. Large Native American collection contains more than 4,000 objects. Highlights the seven major culture areas in the United States: the Northwest Coast, California, the Southwest, the Plains, the Woodlands, Southeast, & the Arctic. 3 South Mountain Ave, Montclair NJ, 973-746-5555. 17th century exhibits & programs exploring the history of Indians & Europeans in colonial NJ. Features Native American artifacts: a dugout canoe, tools, weapons, clothing, ornaments and jewelry. New family friendly exhibit called Hearth & Home offers visitors the opportunity to learn about home life of Native Americans. 205 W State St, Trenton NJ, 609-292-6464. Featuring Hall of the Eastern Woodlands, Hall of Plains Indians, and Hall of Northwest Coast Indians. Showcasing artifacts such as cooking utensils, clothing, weapons, masks, and jewelry from traditional Native American cultures. See models of the wigwam to the longhouse. 79th St & Central Park West, New York NY, 212-769-5100. Learn about the Lenape Indians who inhabited the lower Delaware Valley. View stone and bone artifacts, pottery, and native crafts. 1461 Bridgeton Rd, Greenwich NJ, 856-455-4055. Play Native American instruments while viewing and listening to recordings of American Indian musicians and dancers. Try basket weaving, archeology, the revolving maize game and many other Lenape activities. 25 Brown’s Dock Road, Locust NJ, 732-872-2670. Permanent exhibits including They Lived Here First: The Lenape at Lake Hopatcong. Hopatcong State Park, Landing NJ, 973-398-2616. American Indian gallery with Native people exhibits. View pottery, basketry, bead & quill, and textiles from American Indian tribes. 6 Normandy Heights Rd, Morristown NJ, 973-971-3700. Volunteer resource center for kids and adults of all ages to learn about the First Peoples of the Lenape and Northeastern Woodlands tribes. Get educated about the Fur Trade era and see commonly traded items. 2825 Fish Hatchery Rd, Allentown PA, 610-797-2121. Located within the Watchung Reservation. 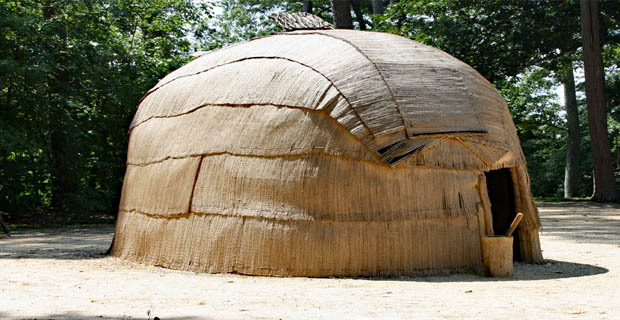 Discover how Lenape Indians lived by experiencing a life-sized, walk-in wigwam. See what it was like to live as a Native American child. 452 New Providence Rd, Mountainside NJ, 908-789-3670. Fun experience for kids! Restored village - see history from a 400-year old Lenape (Delaware) Indian village to a bustling port along the once prosperous Morris Canal. 525 Waterloo Rd, Stanhope NJ, 973-347-1835. Houses a collection of Lenape relics and artifacts: iron stones, weapons, arrowheads, pots, and other daily life tools. 150 E. Commerce St, Bridgeton NJ, 856-451-2620.